Zabul, Afghanistan (July 25, 2010) – Dragoons from the 2nd Stryker Cavalry Regiment and Soldiers from Combined Team Zabul packed the small building on Forward Operations Base Apache Thursday night, July 22, 2010, to pay their respects and honor the memory of a very special hero. 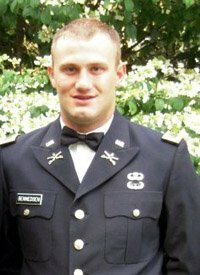 First Lt. Robert N. Bennedsen was killed on July 18, when he was struck by an improvised explosive device when conducting a vehicle recovery mission outside of Qalat, Afghanistan. Bennedson joined 2nd Squadron in 2009 as the logistical support team leader. Bennedson was described by his fellow Cougars as a happy, caring person; the epitome of a Leader and friend. Jones went on to describe Bennedsen as a very dynamic person. Capt. Richard Faille, Bennedsen's close friend, described him as a man with an encouraging and contagious spirit that always leads by example. “He always had the ability to make your day that much better,” Faille said. Faille described his close friend Rob as a guy who always led from the front, was never afraid to get into the trenches and help his Soldiers complete a task. Several others went on to describe Bennedsen as a caring man and a leader. They went on to say that he embodied the character traits of a true hero. All in attendance agreed that the best way to honor their fallen brother would be to carry on and fight the good fight in his honor. Bennedsen is a native of Vashon Island, Washington, where he also served as a volunteer firefighter. He was commissioned a into the U.S. Army Logistics Corps in 2008 after graduating from Seattle University with a degree in Business Management. His awards include the Bronze Star, Purple Heart, the Combat Action Badge, National Defense Service Medal and the Army Service Ribbon. Bennedsen was an avid sportsman who enjoyed football, wrestling and scuba diving as well as restoring classic muscle cars.